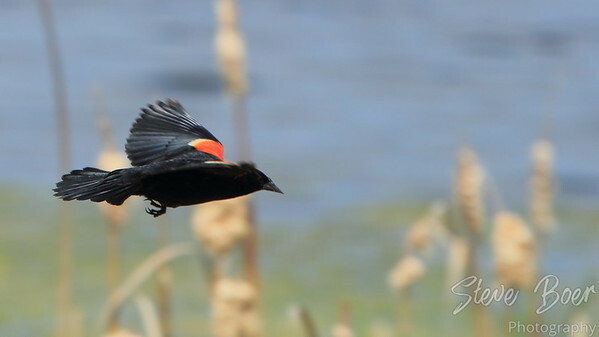 Here is a so-so attempt at capturing a red-wing blackbird in flight. I still have a lot of practice to get in before I’m good at these. I can’t help wondering if a better camera than the 60D would help with focus and tracking, or if it’s all me. 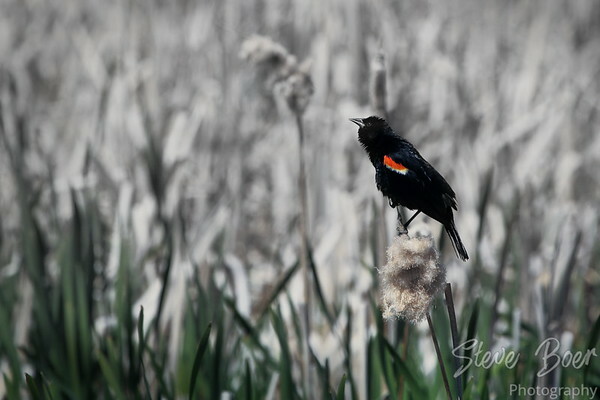 Random number photo 1813 is this photo of a red-wing blackbird that I doctored up a little, removing all of the color except for the bird’s shoulders. I seem to enjoy playing with colour vs black and white with my blackbird photos. This one I converted mostly to black and white, keeping the colouring on the bird and the bottom of the image where the reeds were green. The rest of them were a kind of pale yellow-brown and I think removing the colour from them made the bird stand out a little more. I was trying to capture some in-flight moments yesterday, but none of them really turned out. 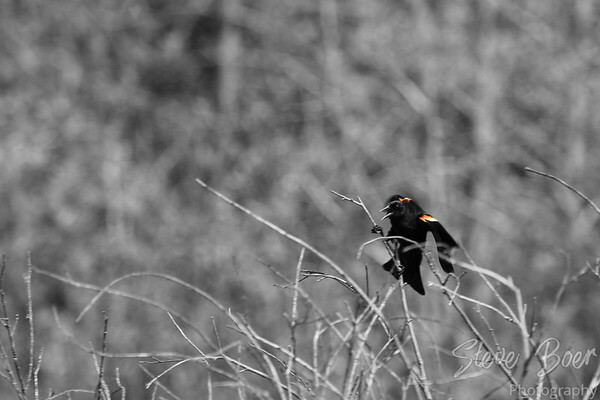 I did like this one photo of this red-winged blackbird though. I caught him at just the time he was flapping from one branch to the next. It resulted in what I think is an interesting photograph and somehow makes him look kind of evil or nefarious. I converted to black and white, but kept just the colouring on his shoulders.